Italian Wine Podcast: Cin Cin with Italian Wine People, the first podcast in English dedicated to Italian wine culture and its main protagonists, is now available in China on the Chinese podcast sharing service Ximalaya.com. On http://www.ximalaya.com/5228876/profile/, Chinese lovers of Italian wines and Italian food culture will now be able to enjoy Monty Waldin’s show from all parts of mainland China. 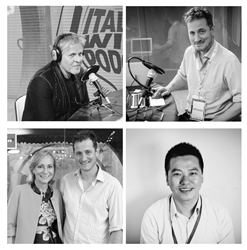 With Italian Wine Podcast, Chinese listeners will be able to better grasp the Italian wine culture and gastronomy through authentic first-hand accounts from people who are immersed in both the culture and the trade. With 76 episodes to date and various thematic series exploring Italian wine regions, native grape varieties of Italy, Italian wine coops, and more, Italian Wine Podcast showcases the unique Italian wine culture through the voice of its key players: producers in the first place, but also wine writers and experts, sommeliers, and various trade professionals. Hosted by Monty Waldin, wine writer and biodynamic wine expert based in Italy, Italian Wine Podcast aims to inform, educate, and entertain about Italian wine through engaging conversations in English with “Italian Wine People.” Italian wine producers tell family stories and anecdotes of often century-long connections with the land. They speak of their wine making approaches, viticulture and terroirs, their syles of wine, as well as their favourite wine and food pairings. Chinese listeners will be able to better grasp the Italian wine culture and gastronomy through authentic first-hand accounts from people who are immersed in both the culture and the trade. Among the Italian wine stories told by Monty Waldin, of an international resonance is the interview with fashion entrepreneur Renzo Rosso, the man behind Diesel Jeans. Rosso, who also produces wine at his Diesel Farm in the Veneto region of Ita-ly, tells Waldin about his humble beginnings growing up on a farm and helping his father with the land and the animals. The podcasts will also be of interest to Chinese listeners as some episodes give an insight into the reception of Italian wine on various Asian markets. Hong Kong-based JC Viens, Editor of the Spirito DiVino Asia magazine, talks to Waldin about the yet-to-be-exploited potential of Italian wine on the Asian markets. Wine educator based in China Julien Boulard speaks in depth about the Chinese market for Italian wine and his favorite Sicilian wines. Former wine buyer for Amazon China and most recently Operations Advisor for wine at Ali Baba, Zhu Mi discusses Italian wine paired with Chinese food and a new favorite of his, Lambrusco. Despite Italian wine exports in China only account for 5% in 2016 of imported wine, there is a strong growth of sparkling wines especially Moscato d’Asti and Prosecco, and a continuing appreciation of Amarone, Barolo, Barbaresco, Chianti, and the Super Tuscans (Source: Jiu Yejia http://www.jiuyejia.com/p/103383.html). China’s interest for Italian wine is also evident in the increasing popularity of wine education courses, such as the advanced program offered by the Vinitaly International Academy, that last September offered two training courses in Beijing and Shanghai. Additionally, over the last three editions of the VIA courses held in Verona during the world-famous Vinitaly wine exhibition, one fourth of the candidates came from China. Italian Wine Podcast will be a precious tool to stimulate interest in Italian wine and to educate wine lovers to Italian wine and its hundreds of indigenous grape varieties. With Italy counting almost 600 indigenous varieties (hence the largest number in the world of native grapes concentrated on its national territory), the show also explores this grape biodiversity with leading experts. For instance, in some of the episodes, Waldin interviews the award-winning wine writer and Vinitaly International Academy Scientific Director Ian D’Agata, who put together the groundbreaking study Native Wine Grapes of Italy (California University Press, 2014). In a concise yet thorough way, D’Agata presents three popular Italian grapes, Aglianico, Sangiovese, and Glera. The Italian Wine Podcast show broadcasts two podcasts a week on the Ximalaya.com channel and also on additional platforms such as iTunes, SoundCloud and on its dedicated website http://www.italianwinepodcast.com. 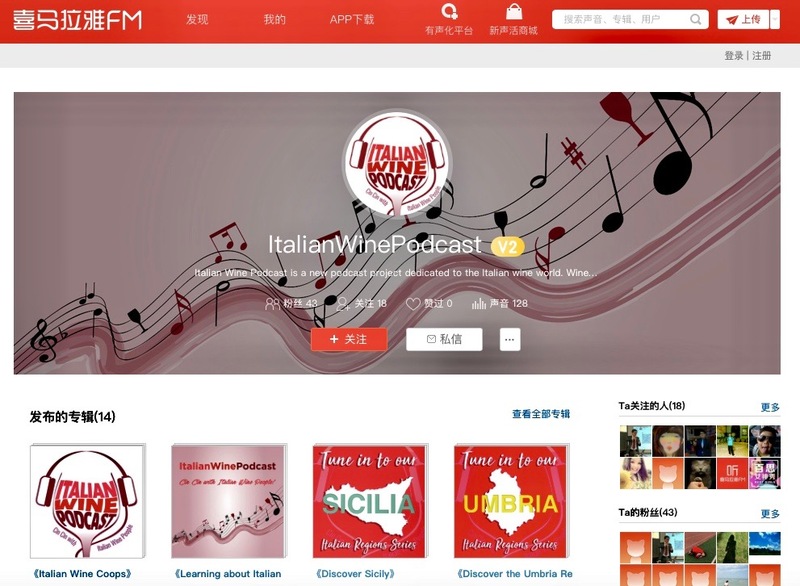 Italian Wine Podcast launches a new channel in China The new Italian Wine Podcast Chinese channel, Ximalaya.